Classic Sci-Fi: THE INVISIBLE MAN | Warped Factor - Words in the Key of Geek. The 1970s were an interesting decade for television. 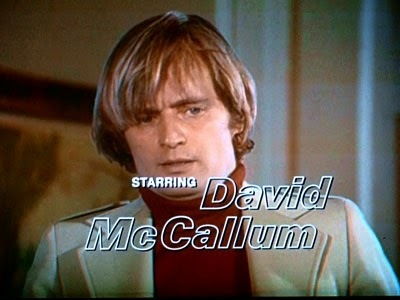 Many shows that should seemingly be pitched at a younger audience were playing to adults in prime time to often massive ratings - take The Six Million Dollar Man as an example. Whenever any show proves to be a sizable hit copycat style series are commissioned, many not managing to get the balance quite right - take The Man From Atlantis for example, and also 1975's The Invisible Man, which easily falls into this demographic challenging category. As Saturday morning style TV this could've thrived, it's certainly enjoyable enough when viewed in this way. It really should've been pitched as a smart intelligent older children's series, which boasted some top television talent (producers Harve Bennett (The Six Million Dollar Man, Star Trek), Leslie Stevens (The Outer Limits) and Steve Bochco (Hill Street Blues, L.A. Law)), complete with music by Henry Mancini (Pink Panther), and starring one of the men from the Man From U.N.C.L.E, David McCallum. 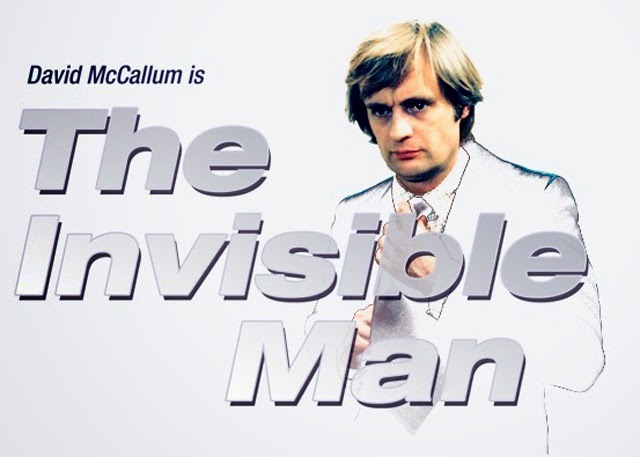 But The Invisible Man was a weeknight affair, a series which had nothing to do with HG Wells source material beyond the concept of a scientist making himself invisible. It's also a series which clearly shows signs that Universal Television couldn't really make up their mind which direction to take it in. The pilot episode is quite dark in tone, capitalising on the political paranoia of the day. Dr Daniel Westin (McCallum) accidentally discovers invisibility as a by-product of different commercial research and finds that boss and backer Jackie Cooper can't wait to break his word and sell it to the military. His phone is bugged and shadowy figures are watching him. Westin appears quite crazed and unstable by all this, so what's a future invisible man to do? No surprises for guessing that he sabotages his invention, but not before temporarily rendering himself invisible. Only problem is his temporary transformation proves not to be temporary. At the end of the pilot we're left with the premise that in return for access to the resources Westin needs to find a cure for his transparency he'll hire himself out to perform special assignments suited to his particular unique abilities. A benign government agent on impossible missions if you will. The series is never quite this bleak again, as by episode 2 the tone is significantly lightened into almost The Invisible Six Million Dollar Man, and so begins a run of 12 Saturday morning TV style episodes. Westin's back story is changed in the title sequence, now his invisibility is the result of an accident rather than his own deliberate sabotage which destroyed the machine. His boss, Jackie Cooper, is recast to a softer, gentler actor, and the impossible missions premise turns out to be investigating crooked truckers, phoney psychics, card sharks, and dirty prison wardens. HIS CODE NAME: KLAE RESOURCE. But if you accept the sudden change in style and go with the flow The Invisible Man is a fun show. 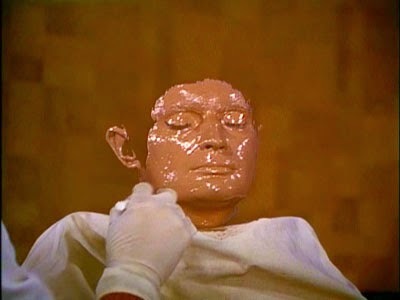 The transformation segments with the mask and make-up are very well done - one memorable episode sees Weston offer his face mask as an escape for someone he has to smuggle out of enemy headquarters, with our translucent hero simply walking out beside him unbeknown to the guards. The fight sequences are now largely played for laughs, as thugs are winded or sent flying by invisible sucker punches - one of the best moments is when a randy but unconscious diplomat-come-art thief is moved around like a puppet by an invisible Westin. Only 13 episodes were produced before The Invisible Man was cancelled, perhaps it was just one genre show too many for the time? Perhaps the shift in tone was a move too far for the adult audience it was craving? Either way the series was rarely repeated, of course it's available now on DVD & Blu-ray and is worth checking out as a little snapshot of mid 70s television science fiction.